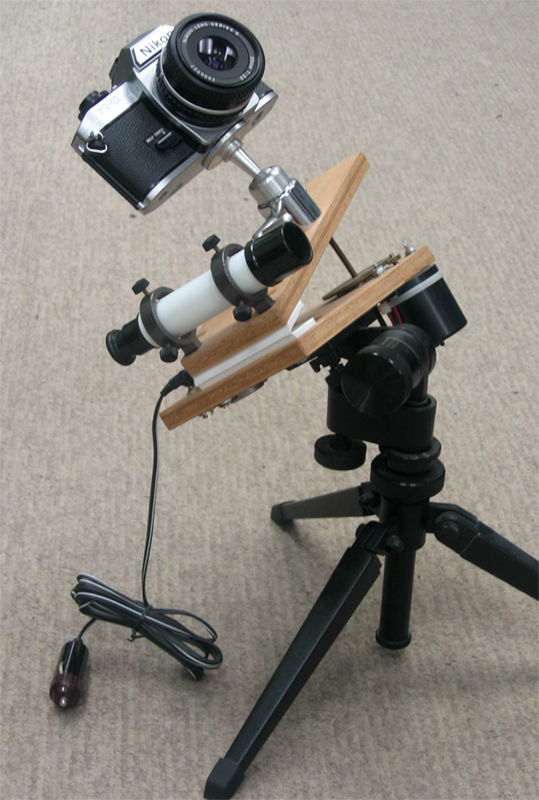 Above: The Astro Kits Camera Drive Kit shown on head of optional tabletop tripod (85,297 bytes). Click on image to see enlarged view (270,654 bytes). This was a commercial product formerly manufactured by Astro Kits, a small home based business in Bronxville, New York. They were in production from the mid to late 1980's. 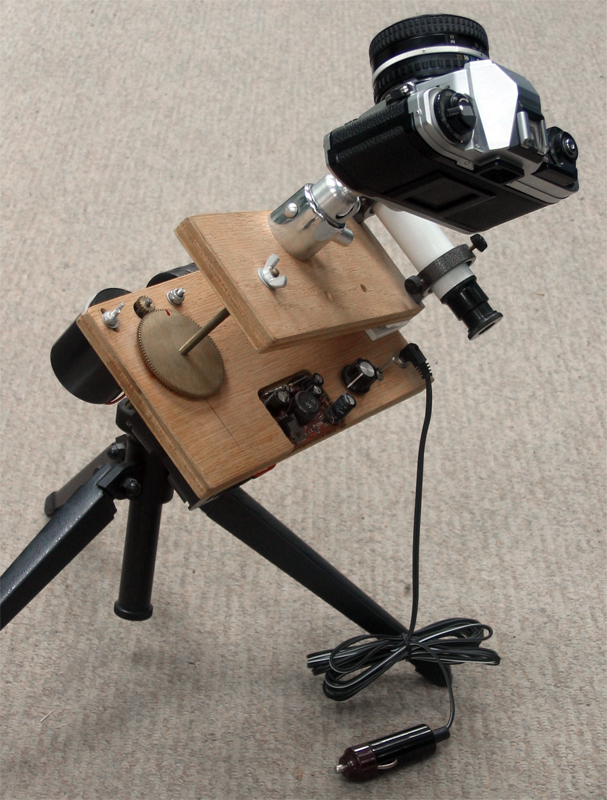 This is a "Poncet" style equatorial tracking platform used with an optional film camera and atop a field tripod and head. It provided an economical and compact means to accomplish simple wide field of view astrophotography. These types of mount are also referred to by terms including "Barn Door" and "Hinged Drive Mount". 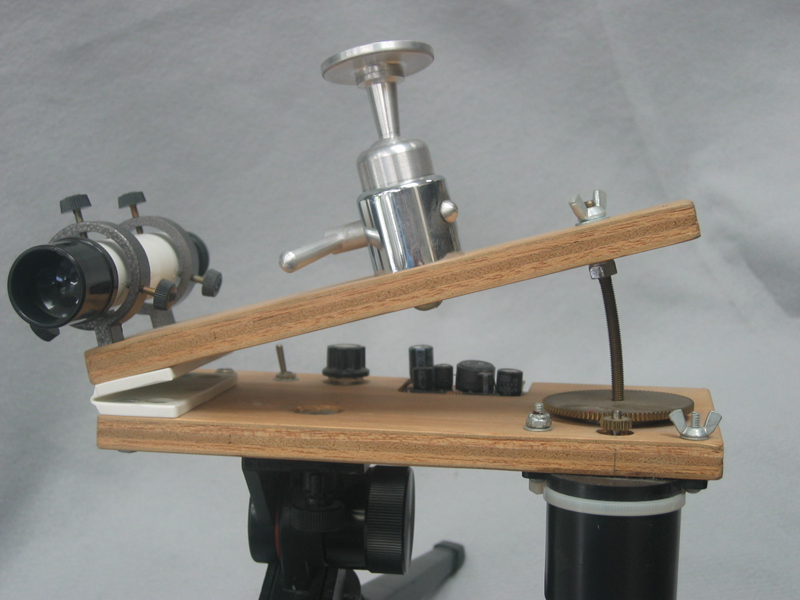 This concept relies on the use of commonly available materials and simple construction techniques to provide the movement of a camera to compensate for the rotation of the Earth. The Earth rotates about its axis and so celestial objects appear to move across the sky in arcs as the Earth turns. This period of 23 hours 56 minutes 04.09053 seconds is called the sidereal period, or the period relative to position of the stars overhead. The sidereal period is not exactly equal to one 24 hour day because by the time the Earth has rotated once complete revolution on its axis it has also moved along the path of its orbit around the Sun. Because of this the Earth has to keep rotating for about another 4 minutes before the Sun seems to be back in the same place in the sky that it was in exactly a day before. As the Earth rotates in space the celestial objects overhead appear to move in an arc across the sky. For an observer located in the Northern Hemisphere these objects appear to rise in the Eastern horizon, then gradually move in an arc up and right across the sky peaking towards the South, and then continue moving to the right and down towards the Western horizon. Above Right: Demonstration of Earth rotation in Quick Time movie format courtesy of NASA (3.0 Megabyte file). Click on image to see rotation - your Web browser must be enabled to view mpg format video. To record the relatively faint, deep sky objects on film requires time exposures on the order of minutes to an hour or more. This makes it impractical to attempt time exposure astrophotography with a conventional camera tripod since it is impossible to precisely move a manual Alt-Azimuth mount so that stars do not appear blurred on the film. The solution to the limits imposed by the manually guided Alt-Azimuth mount is the motorized Equatorial Mount; a platform which can track in one smooth motion in exactly the opposite direction of the Earth's rotation and at a similar apparent rate. Platforms such as this Astro Kit came about in order to permit the photography of celestial objects without having to buy a more costly and bulky conventional equatorial mount. The Astro Kit was made available either as an easy to assemble drive kit, or completely assembled. This compact platform is suitable for use with an optional 35mm SLR camera equipped with lenses of up to about 200 mm focal length. The wood base of the platform incorporates a metal 1/4 inch - 20 tpi (threads per inch) threaded socket so that the entire device can be installed onto a conventional photo tripod head, the platform can then rotated and tilted to "Pole Align" its axis of rotation parallel that of the Earth's axis of rotation. The more accurately one aligns a platform with the Celestial Pole, the more accurate is the tracking; to facilitate this alignment the Astro Kit platform was made available with the optional 5X 24 mm Finder as is provided on the model shown here. Once the platform is "polar aligned" then the aluminum camera ball and socket support permits the camera to be pointed to the area of sky to be imaged and locked into position. A mount such as this can be an excellent, economical way to get into astrophotography of wide sky areas if it is at a dark sky site in either the Northern or Southern hemisphere. 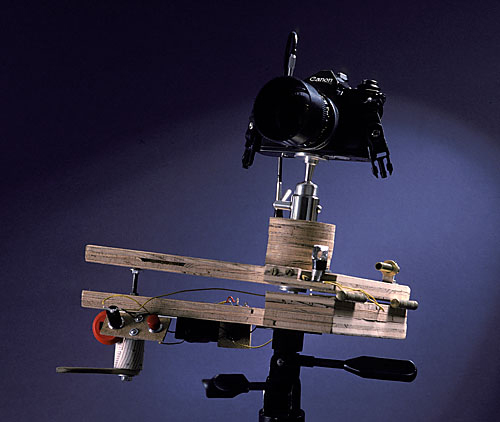 The motorized Astro Kits Camera Drive was developed after a similar Sky Tracker platform design was published in the Fall of 1985. Sky Tracker is a manually operated camera drive developed by Mr. Zullo, a professional freelance photographer residing in Phoenix, Arizona. He devised the Sky Tracker platform to take time exposure astrophotos of Comet Halley. Mr. Zullo's efforts to photograph the comet which peaked in the spring of 1986 produced results that were published in Sky & Telescope and Astronomy magazines among other publications. D = 228.6 / t.p.i. In this formula the D represents the distance from the hinge line to the center of the main gear. While t.p.i. is threads per inch of travel of the shaft. The information about Mr. Zullo's Sky Tracker platform along with his formula was published in the October 1985 issue of Sky & Telescope Observer's Page column on pages 391-392. Above Left: Mr. Zullo's Sky Tracker platform attached to the head of a camera tripod. Notice the manual crank, Timing Cylinder and the indicator Post of Sky Tracker platform at lower left. (64,977 bytes). Click on image to see enlarged view (69,361 bytes). Above Right: Close up view of manual lever, Timing Cylinder, and stopwatch (43,611 bytes). Mr. Zullo devised the timing cylinder, this is a device with a graph drawn over it which illustrates the tracks which the indicator post stay within in order to produce the desired tracking rate. This chart plot is curved to reflect the desired gradual changes in manual tracking speed which are necessitated by the straight shaft employed on the Sky Tracker. The Astro Kits Drive employs the threaded curved rod method to control the rate of descent of the upper deck of the hinged platform; this is a vital aspect of this drive system which eliminates tangent error. In correspondence between Mr. Zullo and Company Seven in May 2005 he explains "the Sky Tracker platform timing cylinder are progressively curved at the bottom. This was the most ambitious part of my version. With them, I attempted to correct for the slowing down of the tracking platform as it became decreasingly parallel to the timing bolt. Of course, with the curved bolt of the Astrokit, that particular correction was not necessary." Left: Astro Kits Drive front right view, shown with optional camera and tabletop tripod (85,297 bytes). Click on image to see enlarged view (321,913 bytes). Using the formula above then the calculated distance is 7.14 inches (181.6 mm). The Astro Kit drive included a 32 thread per inch brass rod which is 5-1/2 inches (140 mm) in length; of this about 4 inches (102 mm) is useable. The center tapped hole in the main gear is designed so that it permits free motion, with no binding of the brass drive rod. This formula is effective when the main gear is rotating at a rate of exactly one (1) rpm. When the large 100 tooth gear is turning at 1 rpm the upper deck is moving at the sidereal ("Deep Sky") rate; the red mark on the 100 tooth gear is a reference mark for measuring the rate. A spot of red paint at the edge of the main spur gear serves as a reference timing mark to help the operator determine if the drive is tracking at an accurate rate. The 5.5 inch long drive rod allows uninterrupted tracking for up to 2.00 hours at a rate of about 32 minutes per inch of useable rod length. The 5.5 rpm drive is powered by four (4) AA battery cells. Tests show the drive will track continuously for more than eleven (11) hours on common carbon-zinc batteries. One final voltage regulating circuit accepts any DC input between 2.0 to 6.5 volt DC then outputs a very stable, temperature compensated nominal 5.00 VDC. This means the battery condition is not critical even at lower operating temperatures. This unit can also operate from twelve (12) volt DC so one can provide power input from a battery pack or from a automobile. The regulator inputs external 12 volt DC and then outputs a very stable 5.0 volt DC to the final regulator. The On-Off-On toggle switch selects either power mode and determines which power source is fed to the main regulator. The toggle center position is "OFF". While flipping the toggle to the left engages the AA battery supply. Flipping the toggle to the right engages the power cord supply. In either case the current draw is about 57 ma (milliamps). A motor voltage dial allows the operator to make small adjustments to compensate for varying camera weights, motor grease thickening in extreme cold, etc. The 4.5 volt DC motor has a no load speed of 5.5 rpm with a nominal stall torque of 15.4 oz.-in. The internal gear reduction of the motor is 342:1. The motor is attached to the lower deck from below and secured with to bolts; one of these deck holes is slotted so that the motor can be loosened and pivoted out to disengage its spur gear from the main gear. The motor drive gear is custom made of brass, 18 tooth which is installed onto the motor drive shaft. The larger main gear is also made of brass with 100 teeth; its hub is shaped to allow it to easily slide into the fully sealed 77R10 radial ball bearing recessed into the lower deck. The hub has a shoulder to prevent rubbing with the face of the bearing or the lower deck. The bearing provides that the curved drive rod has no side play. three way toggle switch, motor potentiometer dial, motor control circuit board, main gear and drive gear (110,900 bytes). Click on image to see enlarged view (380,983 bytes). Pole alignment is quite simple, with the payload (camera and lens) installed and the platform installed onto a secure tripod head one sights up onto a the Celestial Pole along the hinge line from the control side of the lower deck. The hinge is white in color and so this makes it easier to see at night. The optional 5X 24 mm Finder was recommended as an aid to obtain a more accurate alignment of the platform. This was recommended by the manufacturer as being particularly helpful for those operating lenses of 135 mm or longer focal length. The kit instructions included a page describing how to use the conventional cross hair reticle to find the celestial North Pole. Prior to starting photography, loosen the motor and swing it and the drive gear away from the main gear. Then rotate the main gear along the curved shaft so that the gear is two or three inches from the top of the rod. Keep in mind the main gear travels up the rod at a rate of one inch every 32 minutes as mentioned above. Seat the main gear hub into the sealed bearing. Swing the motor back in to mesh its drive gear with the main gear but not so tight that here is binding, you should be able to slide the main gear in and out manually. The main gear speed will be exactly 1 rpm, so the timing mark on the main gear should pass the reference line drawn on the lower deck in sixty (60) seconds. Start the drive with the speed control dial set at the center of its rotation (knob pointing down towards you). When timing the gear, allow the motor to build up its speed before reaching the timing line on the deck - you may check this with a digital watch. Time how long it takes for the gear to make one revolution, not the position of the gear after sixty (60) seconds. If the gear is running slow then turn the motor speed control dial counter clockwise. If the gear is running fast then turn the motor speed control dial clockwise. Observe the timing mark over time and make adjustments to the speed control dial accordingly. If you are planning to attempt longer exposures then watch the timing mark over a longer period. Keep in mind that observing and refining the gear rate over ten (10) minutes can provide a result ten times more accurate tracking rates than a rate set after observing for only one minute. Also be aware that if you change payloads (from lightweight lens to heavier lens for example), then you should repeat the timing adjustment process. The Astro Kit Drives were devised and manufactured by an amateur astronomer working from his residence in Bronxville, New York. Up to the time of when the Astro Kit was introduced amateurs made similar devices based on their own interpretations of amateur telescope making literature. This kit was however, quite an advanced device with refinements to improve accuracy of Pole alignment and tracking. It was thought that with the approach of Comet Halley in 1985-1986 there would be record demand for such an item. Astro Kits sold for $102 in kit form, or assembled for $127 plus shipping. The sales were handled direct from the company and through a few specialty telescope retailers including Company Seven. The kit was recommended in publications including Handbook for Star Trackers by James Ballard. But even in the 1980's the price of making such a comparatively well made kit was high enough that sales never really took off and the product was discontinued, and Astro Kits closed for business. By the late 1990's very inexpensive and compact German equatorial mounts with short tripods made in China became available for as little as $50 for the head, and another $50 for the motor drive system. Today, Company Seven suggests these as more durable and versatile alternatives. These are often provided with slow motion geared controls suitable for simple visual uses. And most of these mounts can accept an optional battery powered Right Ascension electronic drive for those who seek a platform for uses such as the Astro Kits were previously employed. 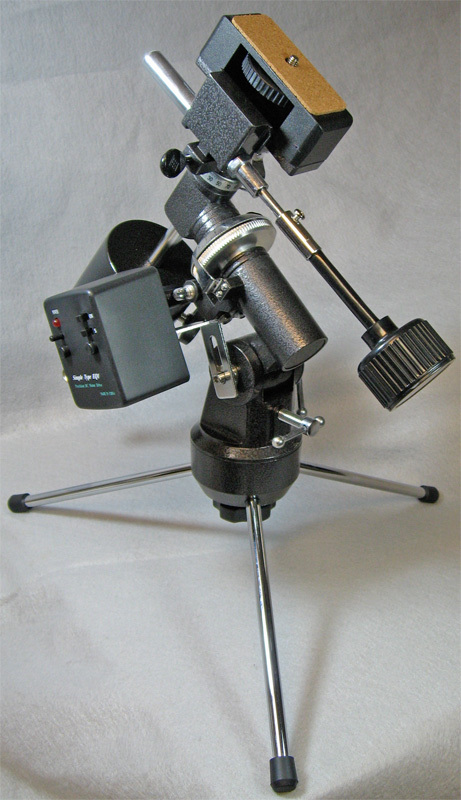 Right: Orion Mini-EQ tabletop German equatorial mount with geared slow motion controls, tabletop tripod legs, optional EC-1 Motor Drive (59,176 bytes). celestial pole is usually satisfactory for low magnification short duration exposure astrophotography. Click on image to see enlarged view (130,877 bytes). If you intend to buy a compact German equatorial mount for travel around the world then be sure to pick one that accepts the optional tracking motor. And be certain that motor control is provided with the capability to be reversed so that the mount can track in either Northern or Southern hemispheres. The unit illustrated here, with its instructions for assembly and operation are in the collection of Company Seven. This kit was assembled and contributed to Company Seven by Mr. Ronald Moltz; it is not for sale.